Witcher contracts in the Witcher 3: Wild Hunt are side-quests that task Geralt with slaying unique, especially difficult enemies who are providing trouble for various people – great winged beasts, malefic wraiths, all manner of beasts are to be fought in these quests, and they take you to all manner of murky, dark and damp location. This is a guide for the Deadly Delight contract in The Witcher 3. Pick this quest up from a notice board in the sprawling city of Novigrad – the one in Hierarch Square – it describes how multiple guards have been killed in some very non-PG ways and the killer, presumed to be Female, must be punished. Head East of your current location to the bridge by the fish market to find the Quest NPC and have a chit-chat. He’ll give you more information about the Quest. Eventually he will point you in the direction of the medical examiner tasked with dealing with the remains of the guards – a task almost as unenviable as yours. Head over to him and, after a conversation, he too will point you off in a new direction, this time the scene of the crime to do some familiar Witcher Sense detective work. Head over and use your Witcher senses – you’ll find two sets of footprints, some belonging to a child and some hoof-prints – oddly, though, the hoof-prints seem to be walking upright on two legs. Doesn’t take a super-sleuth to figure out which you’ll be tracking. Follow the trail the hoofprints lead you on until you end up at the back-entrance of a brothel, the delightfully named ‘Crippled Kate’s’. Go in and talk to the fine establishment’s owner. At this point, you’ll have a choice – you can either use Axii to force the conversation quickly, learning the location of the monster immediately or avoid it and press her for information – assuming you do the latter, because the former kind of solves itself, you’ll be kicked out and forced to find a new lead. 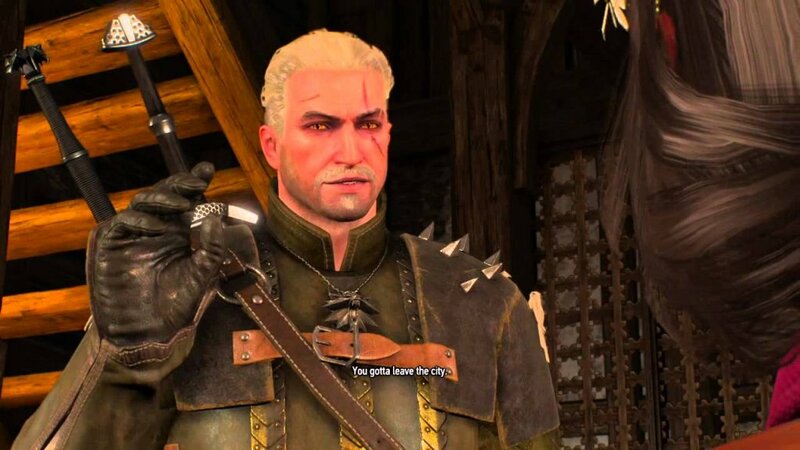 No worries, it’s not difficult to do so, some more Witcher Sensing will lead you to a perfume bottle and a new scent to follow, do so to a Gentleman in the town. This man claims that he has been attacked by a Succubus, he’s standing outside a house that the scent trail leads into. If you’re an adept at putting two and two together, you’ll have realized that’s where the Succubus, Salma is. The door to this house is locked and so you’ll have to find another way in – no problem, just a bit south of this man is another entrance, go in there and follow the stairs up. If you find a small group of what seems to be squatters, you’re in the right place. Go up the ladder, walk the linear pathway, up another ladder and you’ll find yourself able to drop down into our Succubus’ abode. Prepare yourself for the fun part of the quest – killing this guard-slaying monster. Well, it may not strictly be time for that. You do have the option to sympathize with her and allow her to go free – according to her she was acting out of self-defense and was the one actually assailed by the Guards. If you choose to let her go free, obviously your reward from the Guard will falter along with not getting her loot or trophy, though you will receive a reward from her. If you choose to do battle with her, though, here are some tips to ease the experience. As a Succubus, Salma has two main weaknesses, Hybrid Oil and Quen. If you possess any of the former make sure to give your blade a coating before you initiate dialogue to reap its benefits. As for the latter, given the nature of the fight you’ll be using that anyway. The fight is very frantic – whether you win or lose it will be over quickly. Salma will attack you with fiery magical strikes and not relent for a second, in the enclosed environment you find yourself in it’s easy to get overwhelmed and confused, allowing her a few strikes. This is why it’s a good idea to have Quen on-hand whether or not you have it upgraded or not. Giving you just a little breathing room will allow you to compose yourself and retaliate. Salma also has a repulsing attack to gear any melee attackers out of her face – if you don’t have a Quen up to protect yourself you’ll be taking damage from this once or twice, don’t fret, just dust yourself off, dodge her soon-to-follow magical attack and go back on the offensive. Salma doesn’t have much health but can rack up the damage and keep you on the ropes quite easily with the claustrophobic area and frenzies assault – your best weapons in this fight are a level head, matched aggression and Quen. Put all of this to use, don’t panic and you should breeze through Salma – some words of experience, though. Don’t try and use the meltstream igni firing mode, you WON’T set her on fire and she WILL set you on fire whilst you try. After the battle, collect your loot, your trophy and, after returning to the Guard, your reward. Congratulations, you just cleansed the streets of Novigrad of a dangerous strumpet, go to Crippled Kate’s and buy yourself a strumpet as a reward!